There is something indeed mystical about things that are big. Large networks exhibit a certain magnetism and exude a sense of importance that obscures reality. You and I know that it is no more difficult to secure a large network than it is a small one. We all know that over and above a particular number of network clients, the rules no longer change; the only real dynamic is the size of the domain (much like a kingdom) over which the network ruler (oops, administrator) has control. The real dynamic then transforms from the technical to the political. Then again, that point is often reached well before the kingdom (or queendom) grows large. If you have systematically worked your way to this chapter, hopefully you have found some gems and techniques that are applicable in your world. The network designs you have worked with in this book have their strong points as well as weak ones. That is to be expected given that they are based on real business environments, the specifics of which are molded to serve the purposes of this book. This chapter is intent on wrapping up issues that are central to implementation and design of progressively larger networks. Are you ready for this chapter? Good, it is time to move on. In previous chapters, you made the assumption that your network administration staff need detailed instruction right down to the nuts and bolts of implementing the solution. That is still the case, but they have graduated now. You decide to document only those issues, methods, and techniques that are new or complex. Routine tasks such as implementing a DNS or a DHCP server are under control. Even the basics of Samba are largely under control. So in this section you focus on the specifics of implementing LDAP changes, Samba changes, and approach and design of the solution and its deployment. Abmas is a miracle company. Most businesses would have collapsed under the weight of rapid expansion that this company has experienced. Samba is flexible, so there is no need to reinstall the whole operating system just because you need to implement a new network design. In fact, you can keep an old server running right up to the moment of cutover and then do a near-live conversion. There is no need to reinstall a Samba server just to change the way your network should function. Network growth is common to all organizations. In this exercise, your preoccupation is with the mechanics of implementing Samba and LDAP so that network users on each network segment can work without impediment. Starting with the configuration files for the server called MASSIVE in “Making Happy Users”, you now deal with the issues that are particular to large distributed networks. Your task is simple identify the challenges, consider the alternatives, and then design and implement a solution. What do you say to an employee who normally uses a desktop system but must spend six weeks on the road with a notebook computer? She is concerned about email access and how to keep coworkers current with changing documents. To top it all off, you have one network support person and one help desk person based in London, a single person dedicated to all network operations in Los Angeles, five staff for user administration and help desk in New York, plus one floater for Washington. You have outsourced all desktop deployment and management to DirectPointe. Your concern is server maintenance and third-level support. Build a plan and show what must be done. In “Making Happy Users”, you implemented an LDAP server that provided the passdb backend for the Samba servers. You explored ways to accelerate Windows desktop profile handling and you took control of network performance. The implementation of an LDAP-based passdb backend (known as ldapsam in Samba parlance), or some form of database that can be distributed, is essential to permit the deployment of Samba Primary and Backup Domain Controllers (PDC/BDCs). You see, the problem is that the tdbsam-style passdb backend does not lend itself to being replicated. The older plain-text-based smbpasswd-style passdb backend can be replicated using a tool such as rsync, but smbpasswd suffers the drawback that it does not support the range of account facilities demanded by modern network managers. The new tdbsam facility supports functionality that is similar to an ldapsam, but the lack of distributed infrastructure sorely limits the scope for its deployment. This raises the following questions: Why can't I just use an XML-based backend, or for that matter, why not use an SQL-based backend? Is support for these tools broken? Answers to these questions require a bit of background. What is a directory? A directory is a collection of information regarding objects that can be accessed to rapidly find information that is relevant in a particular and consistent manner. A directory differs from a database in that it is generally more often searched (read) than updated. As a consequence, the information is organized to facilitate read access rather than to support transaction processing. The Lightweight Directory Access Protocol (LDAP) differs considerably from a traditional database. It has a simple search facility that uniquely makes a highly preferred mechanism for managing user identities. LDAP provides a scalable mechanism for distributing the data repository and for keeping all copies (slaves) in sync with the master repository. Samba is a flexible and powerful file and print sharing technology. It can use many external authentication sources and can be part of a total authentication and identity management infrastructure. The two most important external sources for large sites are Microsoft Active Directory and LDAP. Sites that specifically wish to avoid the proprietary implications of Microsoft Active Directory naturally gravitate toward OpenLDAP. In “Making Happy Users”, you had to deal with a locally routed network. All deployment concerns focused around making users happy, and that simply means taking control over all network practices and usage so that no one user is disadvantaged by any other. The real lesson is one of understanding that no matter how much network bandwidth you provide, bandwidth remains a precious resource. In this chapter, you must now consider how the overall network must function. In particular, you must be concerned with users who move between offices. You must take into account the way users need to access information globally. And you must make the network robust enough so that it can sustain partial breakdown without causing loss of productivity. The new company has three divisions. Staff for each division are spread across the company. Some staff are office-bound and some are mobile users. Mobile users travel globally. Some spend considerable periods working in other offices. Everyone wants to be able to work without constraint of productivity. The challenge is not insignificant. In some parts of the world, even dial-up connectivity is poor, while in other regions political encumbrances severely curtail user needs. Parts of the global Internet infrastructure remain shielded off for reasons outside the scope of this discussion. Decisions must be made regarding where data is to be stored, how it will be replicated (if at all), and what the network bandwidth implications are. For example, one decision that can be made is to give each office its own master file storage area that can be synchronized to a central repository in New York. This would permit global data to be backed up from a single location. The synchronization tool could be rsync, run via a cron job. Mobile users may use off-line file storage under Windows XP Professional. This way, they can synchronize all files that have changed since each logon to the network. No matter which way you look at this, the bandwidth requirements for acceptable performance are substantial even if only 10 percent of staff are global data users. A company with 3,500 employees, 280 of whom are mobile users who use a similarly distributed network, found they needed at least 2 Mb/sec connectivity between the UK and US offices. Even over 2 Mb/sec bandwidth, this company abandoned any attempt to run roaming profile usage for mobile users. At that time, the average roaming profile took 480 KB, while today the minimum Windows XP Professional roaming profile involves a transfer of over 750 KB from the profile server to and from the client. Obviously then, user needs and wide-area practicalities dictate the economic and technical aspects of your network design as well as for standard operating procedures. Network logons that include roaming profile handling requires from 140 KB to 2 MB. The inclusion of support for a minimal set of common desktop applications can push the size of a complete profile to over 15 MB. This has substantial implications for location of user profiles. Additionally, it is a significant factor in determining the nature and style of mandatory profiles that may be enforced as part of a total service-level assurance program that might be implemented. One way to reduce the network bandwidth impact of user logon traffic is through folder redirection. In “Making Happy Users”, you implemented this in the new Windows XP Professional standard desktop configuration. When desktop folders such as My Documents are redirected to a network drive, they should also be excluded from synchronization to and from the server on logon or logout. Redirected folders are analogous to network drive connections. Of course, network applications should only be run off local application servers. As a general rule, even with 2 Mb/sec network bandwidth, it would not make sense at all for someone who is working out of the London office to run applications off a server that is located in New York. When network bandwidth becomes a precious commodity (that is most of the time), there is a significant demand to understand network processes and to mold the limits of acceptability around the constraints of affordability. When a Windows NT4/200x/XP Professional client user logs onto the network, several important things must happen. The client must register itself with the WINS and/or DNS server. The client must locate the closest domain controller. The client must log onto a domain controller and obtain as part of that process the location of the user's profile, load it, connect to redirected folders, and establish all network drive and printer connections. The domain controller must be able to resolve the user's credentials before the logon process is fully implemented. Given that this book is about Samba and that it implements the Windows NT4-style domain semantics, it makes little sense to compare Samba with Microsoft Active Directory insofar as the logon protocols and principles of operation are concerned. The following information pertains exclusively to the interaction between a Windows XP Professional workstation and a Samba-3.0.20 server. In the discussion that follows, use is made of DHCP and WINS. As soon as the Windows workstation starts up, it obtains an IP address. This is immediately followed by registration of its name both by broadcast and Unicast registration that is directed at the WINS server. Given that the client is already a domain member, it then sends a directed (Unicast) request to the WINS server seeking the list of IP addresses for domain controllers (NetBIOS name type 0x1C). The WINS server replies with the information requested. The client sends two netlogon mailslot broadcast requests to the local network and to each of the IP addresses returned by the WINS server. Whichever answers this request first appears to be the machine that the Windows XP client attempts to use to process the network logon. The mailslot messages use UDP broadcast to the local network and UDP Unicast directed at each machine that was listed in the WINS server response to a request for the list of domain controllers. The logon process begins with negotiation of the SMB/CIFS protocols that are to be used; this is followed by an exchange of information that ultimately includes the client sending the credentials with which the user is attempting to logon. The logon server must now approve the further establishment of the connection, but that is a good point to halt for now. The priority here must center around identification of network infrastructure needs. A secondary fact we need to know is, what happens when local domain controllers fail or break? Under most circumstances, the nearest domain controller responds to the netlogon mailslot broadcast. The exception to this norm occurs when the nearest domain controller is too busy or is out of service. Herein lies an important fact. This means it is important that every network segment should have at least two domain controllers. Since there can be only one PDC, all additional domain controllers are by definition BDCs. The provision of sufficient servers that are BDCs is an important design factor. The second important design factor involves how each of the BDCs obtains user authentication data. That is the subject of the next section, which involves key decisions regarding Identity Management facilities. Network managers recognize that in large organizations users generally need to be given resource access based on needs, while being excluded from other resources for reasons of privacy. It is therefore essential that all users identify themselves at the point of network access. The network logon is the principal means by which user credentials are validated and filtered and appropriate rights and privileges are allocated. Unfortunately, network resources tend to have their own Identity Management facilities, the quality and manageability of which varies from quite poor to exceptionally good. Corporations that use a mixture of systems soon discover that until recently, few systems were designed to interoperate. For example, UNIX systems each have an independent user database. Sun Microsystems developed a facility that was originally called Yellow Pages, and was renamed when a telephone company objected to the use of its trademark. What was once called Yellow Pages is today known as Network Information System (NIS). NIS gained a strong following throughout the UNIX/VMS space in a short period of time and retained that appeal and use for over a decade. Security concerns and inherent limitations have caused it to enter its twilight. NIS did not gain widespread appeal outside of the UNIX world and was not universally adopted. Sun updated this to a more secure implementation called NIS+, but even it has fallen victim to changing demands as the demand for directory services that can be coupled with other information systems is catching on. Nevertheless, both NIS and NIS+ continue to hold ground in business areas where UNIX still has major sway. Examples of organizations that remain firmly attached to the use of NIS and NIS+ include large government departments, education institutions, and large corporations that have a scientific or engineering focus. Today's networking world needs a scalable, distributed Identity Management infrastructure, commonly called a directory. The most popular technologies today are Microsoft Active Directory service and a number of LDAP implementations. The problem of managing multiple directories has become a focal point over the past decade, creating a large market for metadirectory products and services that allow organizations that have multiple directories and multiple management and control centers to provision information from one directory into another. The attendant benefit to end users is the promise of having to remember and deal with fewer login identities and passwords. The challenge of every large network is to find the optimum balance of internal systems and facilities for Identity Management resources. How well the solution is chosen and implemented has potentially significant impact on network bandwidth and systems response needs. In “Making Happy Users”, you implemented a single LDAP server for the entire network. This may work for smaller networks, but almost certainly fails to meet the needs of large and complex networks. The following section documents how you may implement a single master LDAP server with multiple slave servers. What is the best method for implementing master/slave LDAP servers within the context of a distributed 2,000-user network is a question that remains to be answered. One possibility that has great appeal is to create a single, large distributed domain. The practical implications of this design (see “Network Topology 2000 User Complex Design A”) demands the placement of sufficient BDCs in each location. Additionally, network administrators must make sure that profiles are not transferred over the wide-area links, except as a totally unavoidable measure. Network design must balance the risk of loss of user productivity against the cost of network management and maintenance. The network design in “Network Topology 2000 User Complex Design B” takes the approach that management of networks that are too remote to be managed effectively from New York ought to be given a certain degree of autonomy. With this rationale, the Los Angeles and London networks, though fully integrated with those on the East Coast, each have their own domain name space and can be independently managed and controlled. One of the key drawbacks of this design is that it flies in the face of the ability for network users to roam globally without some compromise in how they may access global resources. Desk-bound users need not be negatively affected by this design, since the use of interdomain trusts can be used to satisfy the need for global data sharing. When Samba-3 is configured to use an LDAP backend, it stores the domain account information in a directory entry. This account entry contains the domain SID. An unintended but exploitable side effect is that this makes it possible to operate with more than one PDC on a distributed network. How might this peculiar feature be exploited? The answer is simple. It is imperative that each network segment have its own WINS server. Major servers on remote network segments can be given a static WINS entry in the wins.dat file on each WINS server. This allows all essential data to be visible from all locations. Each location would, however, function as if it is an independent domain, while all sharing the same domain SID. Since all domain account information can be stored in a single LDAP backend, users have unfettered ability to roam. This concept has not been exhaustively validated, though we can see no reason why this should not work. The important facets are the following: The name of the domain must be identical in all locations. Each network segment must have its own WINS server. The name of the PDC must be the same in all locations; this necessitates the use of NetBIOS name aliases for each PDC so that they can be accessed globally using the alias and not the PDC's primary name. A single master LDAP server can be based in New York, with multiple LDAP slave servers located on every network segment. Finally, the BDCs should each use failover LDAP servers that are in fact slave LDAP servers on the local segments. With a single master LDAP server, all network updates are effected on a single server. In the event that this should become excessively fragile or network bandwidth limiting, one could implement a delegated LDAP domain. This is also known as a partitioned (or multiple partition) LDAP database and as a distributed LDAP directory. As the LDAP directory grows, it becomes increasingly important that its structure is implemented in a manner that mirrors organizational needs, so as to limit network update and referential traffic. It should be noted that all directory administrators must of necessity follow the same standard procedures for managing the directory, because retroactive correction of inconsistent directory information can be exceedingly difficult. As organizations grow, the number of points of control increases also. In a large distributed organization, it is important that the Identity Management system be capable of being updated from many locations, and it is equally important that changes made should become usable in a reasonable period, typically minutes rather than days (the old limitation of highly manual systems). Samba-3 has the ability to use multiple password (authentication and identity resolution) backends. 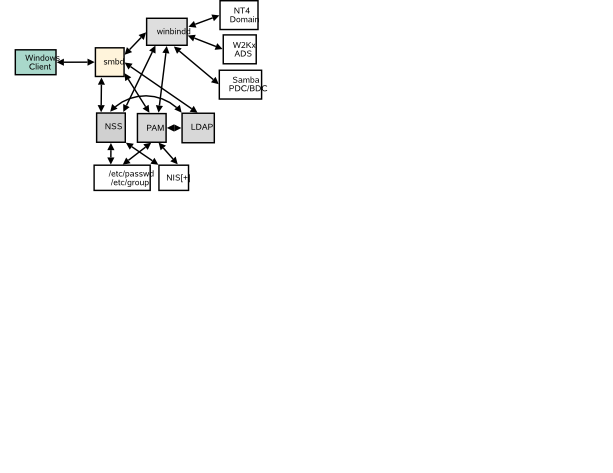 The diagram in “Samba and Authentication Backend Search Pathways” demonstrates how Samba uses winbind, LDAP, and NIS, the traditional system password database. The diagram only documents the mechanisms for authentication and identity resolution (obtaining a UNIX UID/GID) using the specific systems shown. Samba is capable of using the smbpasswd, tdbsam, xmlsam, and mysqlsam authentication databases. The SMB passwords can, of course, also be stored in an LDAP ldapsam backend. LDAP is the preferred passdb backend for distributed network operations. This configuration tells Samba to use a single LDAP server, as shown in “Samba Configuration to Use a Single LDAP Server”. This configuration tells Samba to use a master LDAP server, with failover to a slave server if necessary, as shown in “Samba Configuration to Use a Dual (Fail-over) LDAP Server”. Figure�6.4.�Samba Configuration to Use Dual LDAP Databases - Broken - Do Not Use! If, however, each LDAP database contains unique information, this may well be an advantageous way to effectively integrate multiple LDAP databases into one seemingly contiguous directory. Only the first database will be updated. An example of this configuration is shown in “Samba Configuration to Use Two LDAP Databases - The result is additive.”. Figure�6.5.�Samba Configuration to Use Two LDAP Databases - The result is additive. 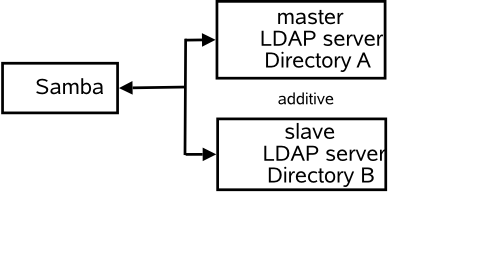 When the use of ldapsam is specified twice, as shown here, it is imperative that the two LDAP directories must be disjoint. If the entries are for a master LDAP server as well as its own slave server, updates to the LDAP database may end up being lost or corrupted. You may safely use multiple LDAP backends only if both are entirely separate from each other. It is assumed that the network you are working with follows in a pattern similar to what was covered in “Making Happy Users”. 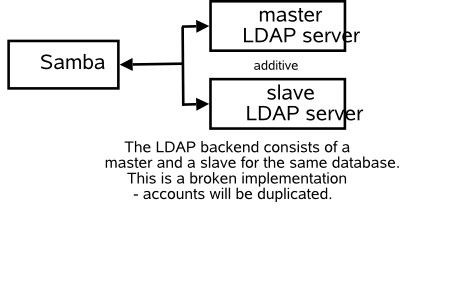 The following steps permit the operation of a master/slave OpenLDAP arrangement. Edit the /etc/openldap/slapd.conf file so it matches the content of “LDAP Master Server Configuration File /etc/openldap/slapd.conf”. Each record is written to the file. Copy the file LDAP-transfer-LDIF.txt to the intended slave LDAP server. A good location could be in the directory /etc/openldap/preload. Log onto the slave LDAP server as root. You can now configure this server so the /etc/openldap/slapd.conf file matches the content of “LDAP Slave Configuration File /etc/openldap/slapd.conf”. On Red Hat Linux, check the equivalent command to start slurpd. Given that this first slave LDAP server is now working correctly, you may now implement additional slave LDAP servers as required. This will install in the secrets.tdb file the password that Samba will need to manage (write to) the LDAP Master server to perform account updates. Where Samba-3 is used as a domain controller, the use of LDAP is an essential component to permit the use of BDCs. Replication of the LDAP master server to create a network of BDCs is an important mechanism for limiting WAN traffic. Network administration presents many complex challenges, most of which can be satisfied by good design but that also require sound communication and unification of management practices. This can be highly challenging in a large, globally distributed network. Roaming profiles must be contained to the local network segment. Any departure from this may clog wide-area arteries and slow legitimate network traffic to a crawl. There is much rumor and misinformation regarding the use of MS Windows networking protocols. These questions are just a few of those frequently asked. Is it true that DHCP uses lots of WAN bandwidth? How much background communication takes place between a master LDAP server and its slave LDAP servers? LDAP has a database. Is LDAP not just a fancy database front end? Can Active Directory obtain account information from an OpenLDAP server? What are the parts of a roaming profile? How large is each part? Can the My Documents folder be stored on a network drive? How much WAN bandwidth does WINS consume? How many BDCs should I have? What is the right number of Windows clients per server? I've heard that you can store NIS accounts in LDAP. Is LDAP not just a smarter way to run an NIS server? Can I use NIS in place of LDAP? It is a smart practice to localize DHCP servers on each network segment. As a rule, there should be two DHCP servers per network segment. This means that if one server fails, there is always another to service user needs. DHCP requests use only UDP broadcast protocols. It is possible to run a DHCP Relay Agent on network routers. This makes it possible to run fewer DHCP servers. A DHCP network address request and confirmation usually results in about six UDP packets. The packets are from 60 to 568 bytes in length. Let us consider a site that has 300 DHCP clients and that uses a 24-hour IP address lease. This means that all clients renew their IP address lease every 24 hours. If we assume an average packet length equal to the maximum (just to be on the safe side), and we have a 128 Kb/sec wide-area connection, how significant would the DHCP traffic be if all of it were to use DHCP Relay? x 3600 (sec/hr) x 24 (hrs/day)= 2288 Mbytes/day. x 512 (bytes/packet) = 0.9 Mbytes/day. From this can be seen that the traffic impact would be minimal. Even when DHCP is configured to do DNS update (dynamic DNS) over a wide-area link, the impact of the update is no more than the DHCP IP address renewal traffic and thus still insignificant for most practical purposes. The process that controls the replication of data from the master LDAP server to the slave LDAP servers is called slurpd. The slurpd remains nascent (quiet) until an update must be propagated. The propagation traffic per LDAP slave to update (add/modify/delete) two user accounts requires less than 10KB traffic. LDAP does store its data in a database of sorts. In fact, the LDAP backend is an application-specific data storage system. This type of database is indexed so that records can be rapidly located, but the database is not generic and can be used only in particular pre-programmed ways. General external applications do not gain access to the data. This type of database is used also by SQL servers. Both an SQL server and an LDAP server provide ways to access the data. An SQL server has a transactional orientation and typically allows external programs to perform ad hoc queries, even across data tables. An LDAP front end is a purpose-built tool that has a search orientation that is designed around specific simple queries. The term database is heavily overloaded and thus much misunderstood. No, at least not directly. It is possible to provision Active Directory from and/or to an OpenLDAP database through use of a metadirectory server. Microsoft MMS (now called MIIS) can interface to OpenLDAP using standard LDAP queries and updates. Desktop folders such as Desktop, My Documents, My Pictures, My Music, Internet Files, Cookies, Application Data, Local Settings, and more. See “Making Happy Users”, “Windows XP Professional User Shared Folders”. Each of these can be anywhere from a few bytes to gigabytes in capacity. Fortunately, all such folders can be redirected to network drive resources. See “Configuration of Default Profile with Folder Redirection” for more information regarding folder redirection. A static or rewritable portion that is typically only a few files (2-5 KB of information). The registry load file that modifies the HKEY_LOCAL_USER hive. This is the NTUSER.DAT file. It can be from 0.4 to 1.5 MB. Microsoft Outlook PST files may be stored in the Local Settings\Application Data folder. It can be up to 2 GB in size per PST file. Yes. More correctly, such folders can be redirected to network shares. No specific network drive connection is required. Registry settings permit this to be redirected directly to a UNC (Universal Naming Convention) resource, though it is possible to specify a network drive letter instead of a UNC name. See “Configuration of Default Profile with Folder Redirection”. MS Windows clients cache information obtained from WINS lookups in a local NetBIOS name cache. This keeps WINS lookups to a minimum. On a network with 3500 MS Windows clients and a central WINS server, the total bandwidth demand measured at the WINS server, averaged over an 8-hour working day, was less than 30 KB/sec. Analysis of network traffic over a 6-week period showed that the total of all background traffic consumed about 11 percent of available bandwidth over 64 Kb/sec links. Background traffic consisted of domain replication, WINS queries, DNS lookups, and authentication traffic. Each of 11 branch offices had a 64 Kb/sec wide-area link, with a 1.5 Mb/sec main connection that aggregated the branch office connections plus an Internet connection. In conclusion, the total load afforded through WINS traffic is again marginal to total operational usage as it should be. It is recommended to have at least one BDC per network segment, including the segment served by the PDC. Actual requirements vary depending on the working load on each of the BDCs and the load demand pattern of client usage. I have seen sites that function without problem with 200 clients served by one BDC, and yet other sites that had one BDC per 20 clients. In one particular company, there was a drafting office that had 30 CAD/CAM operators served by one server, a print server; and an application server. While all three were BDCs, typically only the print server would service network logon requests after the first 10 users had started to use the network. This was a reflection of the service load placed on both the application server and the data server. As unsatisfactory as the answer might sound, it all depends on network and server load characteristics. The correct answer to both questions is yes. But do understand that an LDAP server has a configurable schema that can store far more information for many more purposes than just NIS. No. The NIS database does not have provision to store Microsoft encrypted passwords and does not deal with the types of data necessary for interoperability with Microsoft Windows networking. The use of LDAP with Samba requires the use of a number of schemas, one of which is the NIS schema, but also a Samba-specific schema extension.